All stocked ponds in Wisconsin are required to have either a Department of Agriculture Type 1 Fish Farm registration or a DNR stocking permit. To obtain a Department of Agriculture Type 1 Fish Farm registration call the Department of Agriculture (608) 224-4887 or you may call our office at (866) 208-0724 and we will be happy to help! If you plan on just stocking fish, we can assist you with the DNR stocking form. Contact our office for assistance in obtaining the correct licensing. Most ponds in Wisconsin are considered warm water ponds which are best stocked with bass and bluegills. Not to say that those are the only species you can stock, these are just the species that will thrive in most situations. The stocking recommendations below are rough estimates for ponds 1 acre, with an 8 foot average depth and adequate oxygen. Fathead minnows are used as a supplementary food source for the pond. They can reproduce 3-5 times a year, provided they have adequate cover, providing food for the pond all year. Depending on the available cover and amount of predator fish, fathead minnows may need to be restocked on a yearly basis. Bluegills are the typical fish people think of catching from ponds. They are very easy to catch and can provide many hours of fun for kids and adults. They also are one of the best fish to eat. One advantage bluegills have is there is no need for supplemental stocking because they will reproduce on a yearly basis. One major problem with bluegills is they reproduce prolifically in ponds, which can lead to overcrowding and stunting of the population. The best way to manage a pond is to continually harvest bluegills from the pond and introduce a predatory species such as largemouth bass; largemouth bass will feed on your bluegills helping to keep the population in check. Using both management tools together is the best way to keep bluegill populations in check. Hybrid Bluegills are another option to introduce. They are a cross between a male bluegill and a female sunfish. This cross reduces its potential for reproduction. With this limited potential for reproduction, supplemental stockings are required about every 3 years depending on the amount of harvest. Pumpkinseeds are another species of pan fish which will thrive in most ponds. Pumpkinseeds feed on snails which can carry some parasitic fluke worms. They also make great table fare. They are also capable of reproducing so minimal to no supplemental stocking will be required. Largemouth Bass will do quite well in most ponds in Wisconsin. They will reproduce providing years of angling fun while feeding on fathead minnows and little bluegills which makes them an ideal candidate for stocking in ponds. This will aid in maintaining a healthy food chain balance. Smallmouth Bass will provide great angling and will reach maturity in most ponds but will not reproduce in most situations. The best stocking method is to add them every 2-3 years to have different ages in the pond. Additional stocking of fathead minnows will be required with stocking of smallmouth bass. 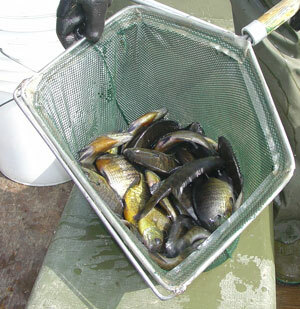 Yellow Perch and Walleye are recommended to be stocked together. This is because perch are prolific breeders in most ponds and there needs to be a natural predator to help control the population. Both of these species need deeper areas to go during the day and the pond needs to be well oxygenated because walleye are one of the first species to die due to low oxygen levels. Both species also require large amounts of food so supplemental stockings of fathead minnows are suggested when stocking perch and walleyes. Northern Pike and Musky are used to help keep bass populations in check. Northern pike and musky prefer to feed on bass because their body shape makes them easier to swallow. These species are recommended when bass populations have become a problem. We recommend stocking one or the other, mixing the two species will not work because northern pike will out compete musky for food. Rainbow Trout provide great angling fun in the fall and winter months. Trout need to have water temperatures below 72 degrees and dissolved oxygen levels greater than 5 ppm. Most ponds in Wisconsin will have water temps above 72 degrees during the summer months. During the fall and winter months temperatures are well below that and dissolved oxygen levels are usually not an issue since cold water can hold more oxygen. You should be able to fish most of them out before the first major heat wave. Many people often wonder when fish spawn and how often. Typically most fish spawn in the spring of the year when temperatures are between 40 and 65 degrees. Bluegills will spawn later in the spring when water temperatures are between 65 and 80 degrees. Bluegills have been known to spawn more than one time in a season, but this is not typical. Largemouth and smallmouth bass will spawn when water temperatures are between 58 and 65 degrees. Once they reach maturity they will spawn every spring. Walleye typically spawn in the spring and look for water temperatures to be 48 to 55 degrees. Northern pike are typically the first game fish to spawn in the spring, needing temperatures of 40-48 degrees for spawning. They have been known to spawn under the ice in certain situations. Musky are another fish to spawn in early spring typically with water temperatures ranging from 48-55 degrees. Water chemistry is very important to a healthy fish population. Most ponds and lakes in Wisconsin can have a healthy fish population without many problems. There are not many situations where water chemistry will not allow for the stocking and survival of fish. The major water chemistry factors involved in fish survival are temperature, dissolved oxygen, pH, ammonia and nitrites. Each one of these presents its own danger when it comes to the health of your fish. All of these factors should be looked at prior to stocking any fish. Temperatureranges for most fish are generally not a problem. Most fish that are stocked in ponds can tolerate most water temperatures we will experience in Wisconsin. During the summer months certain species may not survive as well due to high temperatures. These species would be walleye, perch, and trout. Once water temperatures reach 70 degrees these species will have a hard time surviving. Walleye and perch can survive in most ponds that have depths over 8 feet since the water temperatures at the bottom of a lake or pond will stay below 70 degrees in most cases. Dissolved oxygen is one of, if not the most, important water quality parameter that needs to be looked at prior to stocking fish. Not only does it provide oxygen for the fish, but it also provides oxygen to many microbes and insects that help aid in the overall heath of lakes and ponds. Dissolved oxygen levels need to be at 3 parts per million (ppm) throughout the water column in order to sustain a healthy fishery. If your lake or pond struggles with dissolved oxygen levels, we can assist you with the installation of an aeration system for fish management in your pond. Alkalinity is the measure of the waters capacity to neutralize acids. Alkalinity levels between 50 and 250 mg/L are considered acceptable levels. Most times this parameter is not an issue. The pH of water is generally not an issue in most lakes and ponds. Typically pH levels in most Wisconsin waters range from 6-8, which is recommended for most freshwater fish species. Ammonia levels can and will pose major threats to a fish population. Ammonia generally becomes a problem in smaller ponds that have problems with dissolved oxygen. With proper oxygen levels ammonia is less likely to become a problem. Nitrites can cause major fish kills in ponds and are closely related to ammonia. As fish release waste into the water, bacteria (nitrosomonas) break down the ammonia into nitrites. These nitrites are then consumed by another group of bacteria (nitrobacter), which will convert nitrites into nitrates. Nitrates are then utilized by plant life within the pond.